Boise, Idaho is an unlikely place to find a surf board shaper. Shawn was born and raised in Boise and couldn't escape the surf fever he had. Event organizers recently released complete boat and board reviews from the 2015 Southern Surf Fest! 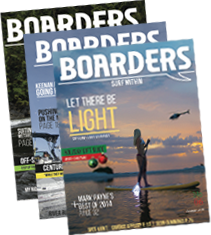 Now you can compare SSF unbiased reviews and the Boarders Magazine Buyers Guide to find your next wake surfboard! What do you get when you combine world class, cutting edge WakeSurf Boats, artisan crafted WakeSurf Boards, a phenomenal group of passionate riders, and one of Northern California's warmest February Days? So what does pro wakesurfer Vanessa Vincent do in the offseason? 100 Wakesurf Shove Its in a row, can it be done? For Charity.. The A6 fin aka Purple Pinky is designed to work with a wake surf skim board that runs 1/2” Futures Fin boxes. The week before the World Wake Surf Championship, Caro Villeneuve and other pro riders made their way out to beautiful Lake Powell. In the upcoming December issue, wake surf enthusiast and photographer Mark Payne takes a look back on the 2014 competitive wake surf season and highlights some of his favorite moments. Be sure and grab a copy of the upcoming issue and see all of Mark's best pics of 2014. Raleigh and Day1 present Kenny Covert with a Custom "Phenom"
Raleigh Hager presented one of her sponsors, Kenny Covert from Covert Ford in Austin, TX with a custom version of her Day1 Wake pro model the "Phenom". The Vic Wake program is happy to announce the inking of a two year extension with 7x Time World Champion Wake Surfer, Bri Chmel. A day before competing at World's on Lake Las Vegas, Korina Smyrek took a little trip out to Lake Mead to enjoy the scenery and catch some airs. For this project I approached three of the top wake surf athletes who have some of the biggest airs in the industry..
Boarders Magazine is proud to be the official sponsor of the first ever wake surf event at the U.S. Open of Water Skiing. The desert in Las Vegas was nothing less than scorching hot for the 2014 World Wake Surf Championship. The event was held at the beautiful Hilton Lake Las Vegas. The competition is heating up after the first day of the World Wake Surf Champion on Lake Las Vegas. As we approach this year's World Wake Surfing Championships, we remember how it started years back and pioneers like Jeff Page who helped pave its foundation. For nearly 25 years, Tige Boats has introduced a number of industry firsts, each one integrated into the product line to make your time on the water the best time.